A West Yorkshire park which features botanical gardens, a boating lake and seven Grade II listed buildings has been voted the best park in Britain. 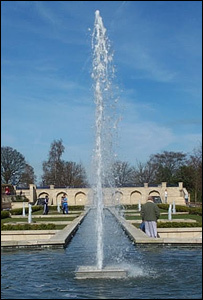 Lister Park, in Manningham, Bradford, took the top prize in the 2006 Britain's Best Park competition. Horticultural experts judged parks on public access, design, their role in the community and maintenance. Lister Park will now take on parks in France, Germany, Sweden and Italy for the European title. The competition has been organised by lawnmower engine makers Briggs and Stratton in association with The Sun newspaper, Horticulture Week magazine, Public Servant Magazine and Garden News. Anne Hawkesworth, Bradford Council's executive member for environment and culture, said: "We are delighted to receive this award and this is a fantastic achievement for us. "Lister Park has proved time and time again that it is one of the best parks in the country. It has a lot to offer for a good day out and is well used by visitors and the local communities. The 55 acre site, which was opened to the public in 1870, also boasts the Cartwright Hall museum and art gallery, the Mughal water gardens, tennis and basketball courts, a bowling green and children's playground.